We did not arrive here alone. We have come into this life through a mother and a father. Even if your parents weren’t available, or they are narcissistic and toxic, your existence here is due to them. Very few of us can attest to having perfect childhood stories. Some of us can’t even remember having that great of times with our families. We all have moments. We have all suffered through our parents’ mistakes. They truly have done the best they could under their capacity. They, too, had teachers who taught them things. They too had misfortunes. We cannot go around divorcing our parents for all toxic energy they continue to instill in their presence. Parents are our first teachers. They are our first superheroes. They become our mentors and the first link to the outer world. Unfortunately, not all parents should be parents. They don’t have the emotional ability to even care for themselves. 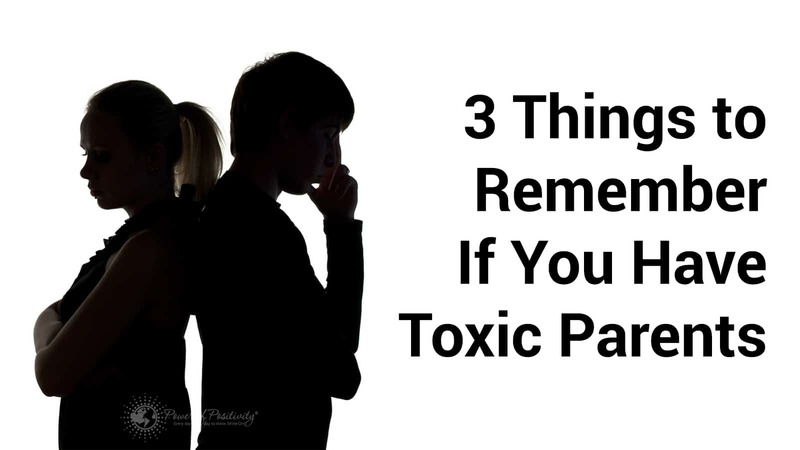 For those of you who know this first hand, here is some advice on dealing with your parents’ toxic attitudes. 1. You have survived the unthinkable. Your parents teach you the fundamental parts of existence: survival, existence, and your place in the world. Unfortunately, not all parents should be teachers either. They, themselves, did not have the grounding and rooting of good parents. Many of you have had no love, felt the disconnection through physical and emotional abuse, and the turmoil of feeling worthless. And yet, here you are! Here you are moving through this world in your unlimited capacity. Your parents have taught you a grand lesson: you get to decide what you are and who you are regardless of your upbringing. You are not limited or incapable of change. You have morphed and have evolved to become you. You don’t have to speak to your parents or acknowledge them for everything, but you do have to forgive them and yourself in the process. You forgive yourself for believing the smallest and largest parts of childhood. Some of the things parents do to their offspring are unthinkable, inconceivable and horrific. You get to decide how you move in this world because of your past. You have the ability to change the stories by not reliving the stories. 2. You give the same amount of respect that you receive. Criticism is not a death sentence. If judgments, dishonoring and belittling were swords or guns, we would be dead. They are not. For every harsh remark, critique, opinion and negative scorch our parents have made, we get to use that as a choice to do better or be smarter. Sometimes parents want the best for us and believe that by coming down on us, they are encouraging a change. At times, parents do not know boundaries. They feel entitled to voice every opinion to their children. They intersect, input and inform over and over regardless of how you try to stop them. Your parents are the first group of people in your life that you trust. As adults, you don’t have to anymore. You do not owe them a life sentence. You get to show the same respect that you have been instilled with during this journey. We don’t have to walk on our tiptoes swallowing all the toxic energy. We have had amazing teachers in our parents to know how much to tolerate. Respect, trust and love are earned. It doesn’t matter if it’s a parent, a sibling, a boss, a mate, or a stranger. 3. We are mirrors of one another. What have you learned from your parents? Try to remember the good things as well. They might be small in comparison, but your parents have taught you great things about yourself. Are you strong, smart, or successful? Did you get a talent from one of them? Did you learn what not to be with your own children? Have you experienced a great awareness because of a parent’s abuse, unthinkable behaviors, and exploitation? Sometimes, we become the things we hate and try deeply to avoid, while other times, they show us what not to become. If your parent was a monster, you have the ability to see it and work on never becoming like them. You get to transform and transcend through your pain. Parents teach us things that are important in life: attachments, love, knowledge, anger, patience, intolerance, and fear. They show us the good and the bad. Many times, their own actions are based on their fears and regrets. They just don’t know how to show it or evolve from them. But, you get to decide what you can and will tolerate now. Not all of us have to be drastic in our relationships with our folks. It isn’t until you have your own children that things start to click at times. Stress, anxiety, fears and their own upbringing interfere in parenting. But, you owe it to yourself to forgive, heal, and love yourself in a way that they were incapable of providing. You get to learn from their lessons, without using every memory as a crutch to stay in negativity. You are not existing here on earth. You are striving to evolve and learn through love, vulnerability and compassion. It’s easy to help others when they never hurt us. Parents require that we learn how to truly be empathetic and kind, especially with ourselves first. You hold the power to be better than you were told and shown to be in childhood. You are the only one who can learn from it.